Systems Science: The Next Scientific Revolution? This presentation by Tim Evans, the Assistant Director General at the World Health Organization (WHO), was given at the Global Forum for Health Research. 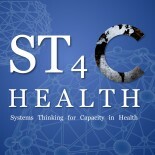 It’s worth taking a look; in it, Dr. Evans outlines the need for systems research, proposes some future directions, and suggests that there needs to be a shift in the way that science approaches research and implementation to include systems-based thinking. This entry was posted on December 23, 2009 by chads in Uncategorized.